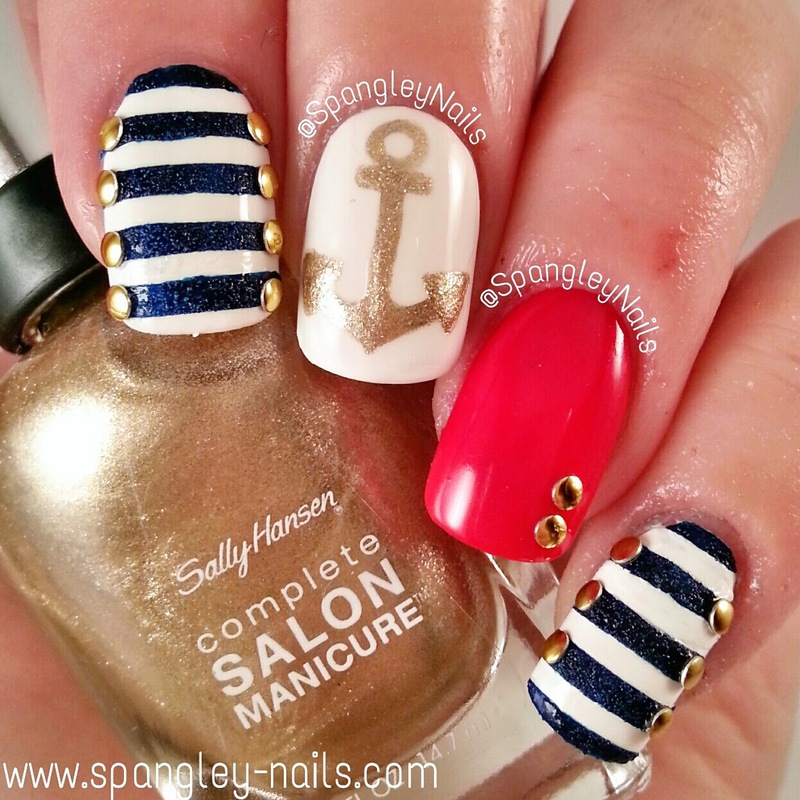 Spangley Nails | UK Nail Art Blog: Nautical Nail Art & The Launch Of The New Spangley Nails! 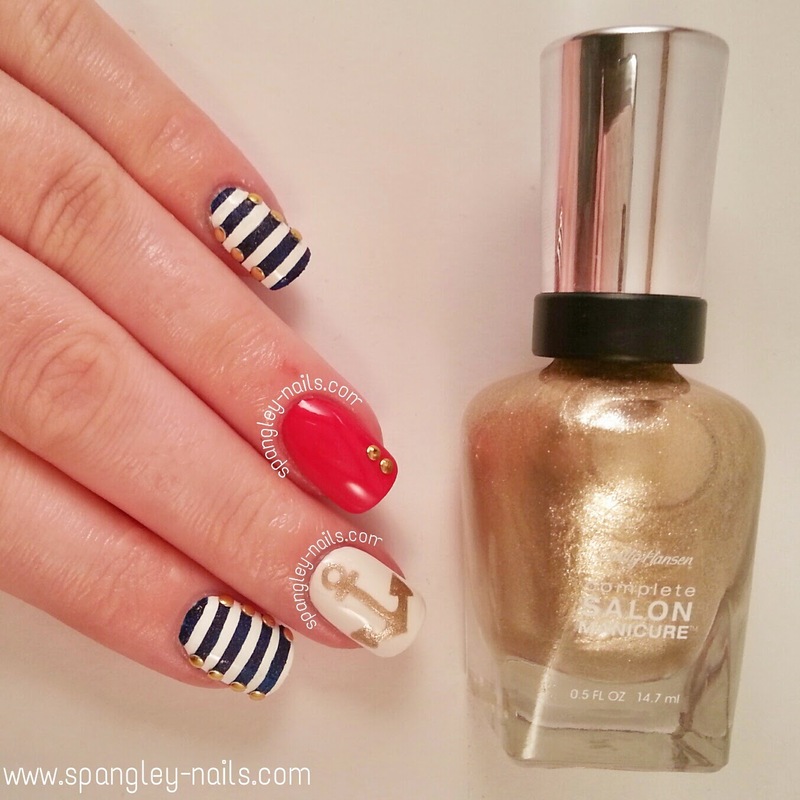 Nautical Nail Art & The Launch Of The New Spangley Nails! I am very very very excited to welcome you, as I have some really exciting things planned to take Spangley Nails to the "next level," and where ever that is - I hope to see you there, friend! Things will still be relatively the same - regular nail art, videos, tutorials and swatches BUT I hope to throw in some extras & have set things that I post on set days as well. For example, if you have been here a while, you may remember I used to post my "Then & Now" manicures on a Wednesday - this will now be moved to a Thursday to tie in with the very popular hashtag #TBT which stands for Throw Back Thursday. 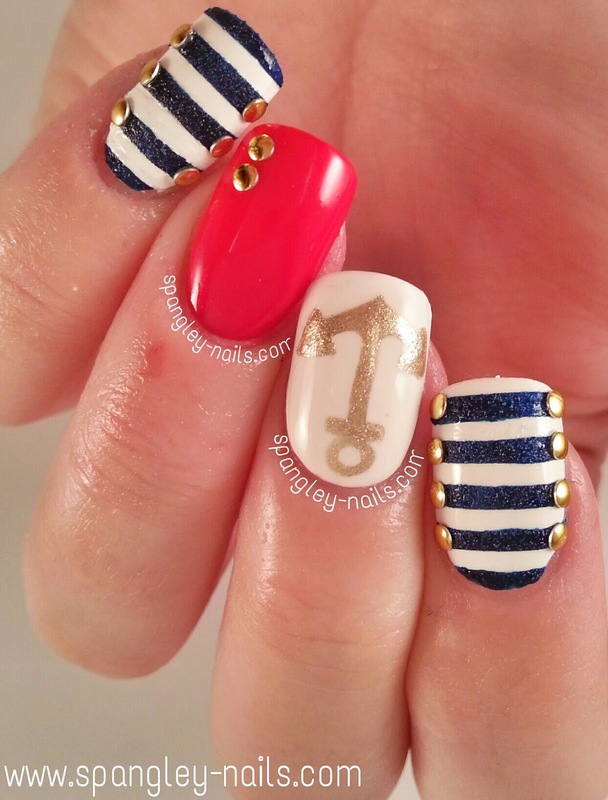 Onto today's nail art though, is this nautical themed manicure. Video tutorial will be after the jump, as well as all details on polishes and methods used. To start off, I painted my index, middle and pinkie fingers with Sinful Colors Snow Me White, and added a coat of Seche Vite to the index and pinkie in preparation for my nail stickers. As the nail needs to be completely dry before applying the stickers, I find adding a layer of top coat really speeds up this process. Next, I drew the anchor onto my midde finger using my thin nail art brush* and Sally Hansen Complete Salon Manicure Wedding Glitters. The process of this is really simple as you'll see from the video below. I topped it off with some Seche Vite. I went back to my index and pinkie fingers and added various straight nail stickers until my nail was evenly covered and painted over the top with Sally Hansen Sugar Coat Laughie Taffy. Once that was dry - which does take very long, I added a spot of Seche Vite to the edges of the blue stripes to act as an adhesive for small gold studs* that I placed along each side. For my ring finger, this is 2 thin coats of St James and more of the gold stud to the bottom right of the nail. The 2 items marked with a * above were purchased from The Born Pretty Store. If you place an order with them, use my code LJL91 to get a 10% discount on your purchases. I hope you enjoying my introduction into the new Spangley Nails and are excited with whats to come. Please stay tuned for loads more & don't forget to check me out on Facebook, Twitter or Instagram. Music is the Pirates Of The Caribbean Theme Song - I do not own this music.